Call A to Z Entertainment, Inc. today for free information about how to hire or book country and western music singers Riders in the Sky. Having helped hundreds of clients, we are your best agency and agent booking and hiring the funny country western music group, Riders In The Sky! We book or help you hire any live professional entertainment you want, to include live country music singers, musical comedy bands, and country and western musicians. We also help you plan and produce your event or show. So call us today at 888-655-4575 and we’ll be happy to help you. In addition to being inducted into the Grand Ol’ Opry, Riders In the Sky are in the Western Music Association’s Hall of Fame, the Country Music Foundation’s Walkway of Stars, and the Walk of Western Stars along with Gene, Roy, John Wayne and other cowboy legends. 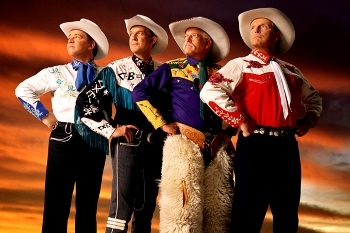 No less important than their two Grammy wins, Riders have been the Western Music Association’s “Entertainers Of the Year” six times, and won “Traditional Group of the Year” and “Traditional Album of the Year” multiple times. The Academy of Western Artists has named them “Western Music Group of the Year” twice in 5 years, and the National Cowboy & Western Heritage Museum has bestowed Riders In the Sky with their Wrangler Award statuette three times. With over twenty years of successful experience, we’re your best agency and agent for booking and hiring funny country and western music singers Riders In The Sky, so call us at 888-655-4575 today and we’ll be happy to help you. We can help you book and hire any live country music bands, musical comedy singers, and country and western singers in addition to those you see here on our site. We’re not the exclusive booking agency of any live entertainers on this site, but we’re one of the best!